As featured on the front page of February 23rd’s USA Today, the AAA Foundation for Traffic Safety is studying ways to help drivers navigate the safest route to their destination thanks to the United States Road Assessment Program (usRAP). Pilot programs have been conducted in eight states—Florida, Illinois, Iowa, Kentucky, Michigan, New Jersey, New Mexico and Utah—with more states to be added this year. These pilots used crash and other relevant safety data to map the relative risk of roadways in the states. The goal over the next few years is to implement usRAP nationwide and ultimately use data and technology to provide drivers with information for avoiding dangerous corridors at the touch of their GPS navigational screen. By doing this, drivers could access the safest route from place to place in addition to the fastest or least congested. According to a recent foundation survey of 2,141 drivers, 73% said they would consider this type of information helpful when seeking driving directions in unfamiliar areas, such as traveling out of town for business or on long car trips with the family. 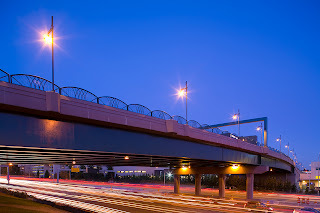 usRAP was initiated to more effectively manage road safety and ensure that assessment of risk plays a key role in strategic decisions on road improvements, crash prevention and standards of route management. To learn more, take a look at our brochure, or view maps of high risk areas in states from the program’s early phases. Last weekend our communications team, video and still cameras in hand, documented crews crushing the almost 60-year-old SR 99 northbound on-ramp at First Avenue S. into bits. 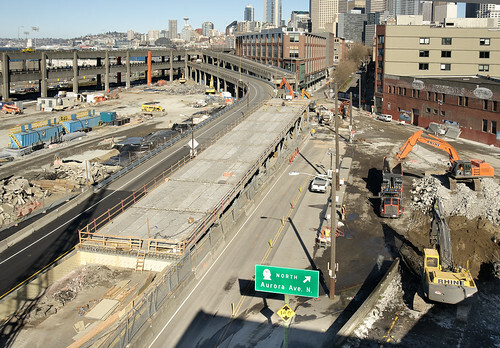 With a piece of the Alaskan Way Viaduct now gone forever, the race is on to build a replacement on-ramp to northbound SR 99 from S. Royal Brougham Way. Drivers will enter from S. Royal Brougham Way between First Avenue S. and Alaskan Way S. when the new on-ramp opens. The ramp change will work as part of an SR 99 detour that will keep SR 99 open and traffic moving when crews demolish the viaduct south of S. Dearborn Street in 2012. Our goal is to open the replacement on-ramp by April 1, before the Mariners’ April 8 home opener and all but two Sounders FC matches. This means there will not be a northbound on-ramp near the stadiums for up to six weeks. ...and more photos on the way. The last three months have been very frustrating, for you and us. We’re working hard to support, improve, and promote Amtrak Cascades as a viable transportation option. When the trains aren’t running, it impacts us all. It is expected that we will have some mudslides along the Amtrak Cascades rail line between October and March, but this is ridiculous! Normally, we average anywhere from three to 10 mudslides over a six-month period, but in the last three months we’ve had nearly 20. There were 16 mudslides that kept 90 trains from reaching their destination in Dec. 2010 alone. Seventy-eight of those trains were on the Seattle to Vancouver, B.C., leg. This happens to be our most mudslide-prone problem area. 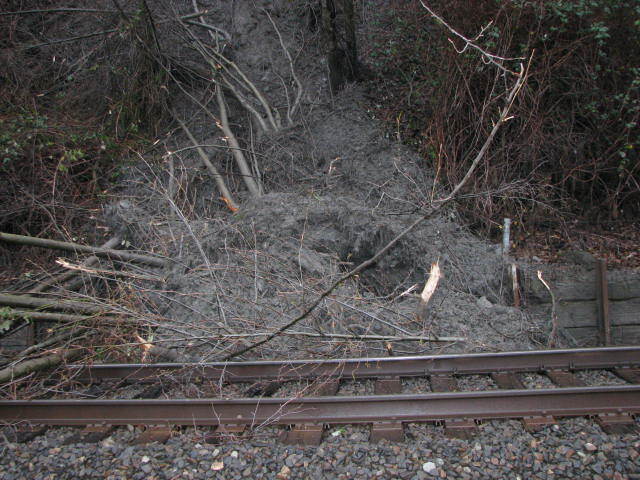 What’s even worse is that any time there is a mudslide, regardless of how severe, an automatic 48-hour moratorium is imposed on passenger rail service. All passenger rail service comes to a halt, and as you can imagine, this is very inconvenient for passengers, Amtrak and us. Adding to the frustration is the fact that the moratorium doesn’t apply to freight rail service. Obviously, this is done for safety reasons. Freight trains carry goods and passenger trains carry people. As you’d expect, people rate higher than a train carrying athletic shoes and televisions. 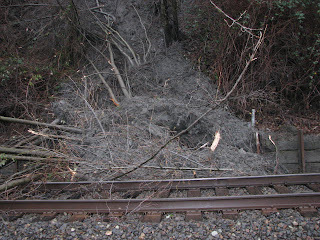 Plus, it is important to ensure that the area where a mudslide occurred is stable before sending passenger trains through. When a mudslide occurs and disrupts train service, Amtrak works very hard to make sure all affected passengers get where they need to go. All available bus companies are contacted and put in to service if available. In the case of the mudslides over this last weekend, buses were in very short supply and Amtrak was not able to get enough to cover all the affected passengers. What are we doing about the mudslides, you ask? There are more than 60 areas along the 466-mile route for Amtrak Cascades that have been identified as at risk for mudslides. That’s a lot of area to cover. 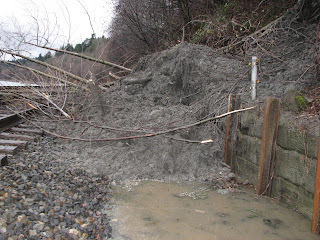 The majority of mudslides occur in the Everett area. There are also a decent number of mudslides in British Columbia that affect our trains. This not only affects Amtrak Cascades, but also Sound Transit’s Sounder and the Amtrak Coast Starlight long-distance train and BNSF Railway freight trains. We are working with Sound Transit, Amtrak and BNSF to find a solution. The biggest challenge is funding. Before we can start any improvements, we have to complete an environmental assessment (EA) to determine potential key environmental impacts before beginning any construction. There is currently no funding for the EA – without it, we can’t begin construction to fix the problem. We applied for federal funding for this issue twice in the last year, but have not yet received any awards. We will continue to try and secure funding and collaborate with Sound Transit and BNSF. For the mudslide areas in British Columbia, we are working with the Canadian government to explore options to fix those problem spots on the corridor which are on their side of the border. In the meantime, we hope that the rain and mudslides subside so the trains can continue running unimpeded. Amtrak Cascades finished 2010 with extraordinary ridership totals (838,251 an all-time high) and we added free Wi-Fi at the end of January. Kudos to our partner Amtrak for doing their best to get people where they need to go in spite of the mudslide challenges. Sideways rain in Grays Harbor last weekend couldn’t stop more than 200 people from cheering the start of construction on the SR 520 pontoon project in Aberdeen. Gusts from the coast that roared up Saturday only underscored the need for project everyone was celebrating: The aging SR 520 floating bridge on Lake Washington is vulnerable to windstorms and we are going to replace it. The 33 pontoons – giant floating concrete boxes – to be built in Aberdeen starting this year will form the backbone of a replacement bridge. Local carpenters and trades workers turned out to celebrate, saying they’re ready to start earning paychecks on the project. We’ve been working hard to get started on construction, and Grays Harbor is eager for the work. The $367 million project will ramp up to 300 direct construction jobs later this year. Work starts this week on a casting basin – a big bathtub of a work zone on Grays Harbor. The basin will be connected to the water so new pontoons – many as long as a football field – can be built in the basin, floated out and towed to Seattle. They’ll each be three stories tall and narrow enough to fit through the Ballard Locks when complete. Some of the 33 new pontoons will weigh 11,000 tons each – as much as 23 Boeing 747s. Take a look at our step-by-step guide to building a floating bridge to see what we have planned starting in 2012. The same windstorm that hit the coast this weekend also sent high winds hammering the SR 520 floating bridge, giving a timely reminder why building a new bridge is so important. Since 1993, we’ve repaired about 30,000 feet of cracks in the pontoons to keep the bridge afloat and safe for traffic – but it’s time to build a stronger replacement bridge. It’s scheduled to open to traffic by the end of 2014. Check out the Flickr photos, our YouTube video or our project page for more about the project. Earlier today, U.S. Secretary of Transportation Ray LaHood gave special recognition in his blog to the AAA Family for the extensive contributions made over the years in the area of driver education. The Secretary acknowledged AAA’s work in supporting teen driver education, including a new teen website containing information useful for parents and teens, as well as contributions and research that have been made on other issues such as driver distraction and drunk driving. The AAA Foundation for Traffic Safety has been a strong contributor to the AAA Family’s success in these areas over the years. The Foundation has conducted research related to Graduated Licensing, brought awareness to the problem of cell phone use while driving and highlighted the repeated dangers of drunk driving during the holidays. I’m proud of the work the AAA Foundation has done and will continue to do in support of the AAA family’s goal of improving the safety of our roads through both driver education and meaningful research. I learned this week that we paint a lot of things Washington Gray which seemed redundant to me especially this time of year when so much of the western half of this state is just flat out gray from skyline to skyline, sun up to sundown. I was researching the new Aurora Seismic project. We will wrap earthquake protection around columns that support the bridge… and then paint the columns Washington Gray. Apparently, concrete comes in all different colors and when we match old bridges to new, current work to decades-old work, and even concrete strengths (4000 PSI vs. 10,000 PSI) the grays don't match. We paint the structures the same gray so they do. It also allows us to repaint over graffiti quickly and inexpensively and leaves a more aesthetically pleasing look. But it's not all Washington Gray. We use Mt. St. Helens Gray when we want to spice things up a bit or blend in. Noise walls that sit off the roadway in foliage get Mt. St. Helens Gray so they're less noticeable. It's all about gray camouflage. 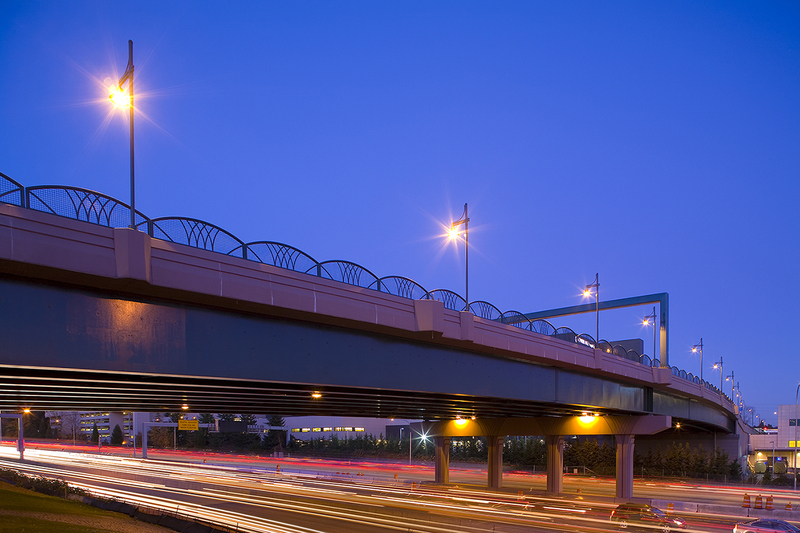 Washington Gray - Used for bridges, concrete columns, walls that support ramps, and noise walls near the road. Mount St Helens Gray - Used primarily in the greater Seattle area for noise walls a little farther away from the freeway near foliage. Locals along the I-405 corridor wanted something different still. They wanted Mt. Baker Gray and Cascade Green. Snoqualmie Pass and North Spokane corridor folks wanted something warmer than gray, something taupe-ier (is that even a word?) I don't blame them, though. By February, a taupy overpass is cheaper than a trip to Hawaii for every Spokane resident. We aren't alone in this context sensitivity. Many states do it. In the Southwest, they opt for more vibrant colors – pinks and yellows. California chooses adobe. I guess we've learned to love gray! Dismal Nitch is a rural area on State Route 401 in Pacific County, about a mile northeast of where the US 101 Astoria-Megler Bridge touches down in Washington. It got its unusual name from the famed Lewis and Clark Expedition. The expedition was traveling down the Columbia River in the winter of 1804-1805 when a terrible storm trapped them in a small, rocky cove. They spent a miserable week there, hungry, cold and soaked to the bone. In his journals, Captain William Clark referred to the place as “that dismal little nitch,” and the name stuck. Today the area is home to a national park and one of our safety rest areas. Both are inaccessible from the south at the moment, because SR 401 is closed due to threat of landslide. Maintenance crews out of Naselle maintain this section of SR 401. After two small slides in the area last week, crews called in investigators from our geotechnical staff in Olympia to take a closer look at the hillside above the highway. Investigations determined that a large portion of the hillside was very unstable and could slide at any time. We immediately closed the highway brought in an emergency contractor in for the job. Further assessment determined that about 17,000 cubic yards of loose soil, rocks and other debris has to be removed to stabilize the slope (that's about 1,700 dump truck loads of dirt)! Battle Ground-based contractor Tapani Underground Inc. started working Friday, Feb. 4. Crews will work daylight hours, seven days a week. Repairs could take up to a month, and the highway will remain closed until geotechnical experts determine that the slope is stable enough to allow traffic through. In the meantime, it’s a tedious commute for those living north of the closure. They have to take a 30-mile detour on SR 4 and US 101 to get to work and shopping in Long Beach and Astoria, Ore.
We never like to inconvenience people like this, but as they say, it’s better safe than sorry. Nobody wants to get stuck under 1,700 dump-truck loads of dirt on the way home from the grocery store. That would turn a difficult drive into a truly dismal one. View more photos as crews work to clear the unstable dirt from the area. Imagine going all over the country, exploring places that are usually off limits to the general public. 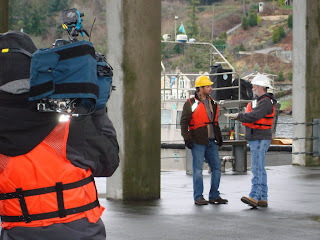 A film crew shooting a documentary for The Travel Channel was in town recently to explore the inner workings of the SR 520 bridge - the longest floating bridge in the world. Our crews love doing this kind of thing. They are so proud of their bridges. Bridge superintendent Archie Allen did the show-and-tell with a six -person film crew and show host Don Wildman. Outfitted with a microphone, Archie took the crew to mid-span where a boat waited for us. We cruised down the side of the bridge to a spot under the east highrise and then plunged into a pontoon to show them anchor cables, water sensors and how the heck we keep a concrete bridge afloat! View more photos on our Flickr site. This Travel Channel crew spends up to three weeks on the road at a time, working 12 hour days for six days straight, living out of suitcases and schlepping lots of gear through airports around the country. Wildman was excited to tour the bridge. “I love doing stuff like this,” he said. “I get to meet people, go places and see things that most people don’t.” Archie said the crew was easy to work with and the host seemed genuinely interested in the bridge. He thought it was neat that a TV show is highlighting an area of Seattle that’s not one of the usual spots like Pike Place Market. “There are things like our floating bridges that are kind of unique to the city and in turn make our city unique,” Archie said. The Seattle episode of “Forbidden Access” featuring the floating bridge is tentatively scheduled to air in September. Mother Nature has brought harsh conditions to many regions already this winter and recent weather reports seem to be predicting more of the same. While winter can be a great time for traveling and fun activities like skiing, snowboarding and ice skating, it’s important that drivers learn how to adapt to the challenging conditions winter can present. •Understand what kind of brakes your car has (standard or anti-lock) and how to use them in slippery road conditions. •Plan ahead by checking road condition reports before you drive and leaving early to give yourself time to drive slowly and safely. •Put a winter driving kit in your car that includes blankets, water, snacks, a first-aid kit, cell phone, shovel and kitty litter or sand. I also suggest that all drivers take a look at these AAA brochures, Get A Grip and How to Go on Ice and Snow. For more tips on how to prepare for and handle driving in winter weather, visit the AAAExchange website. Last Friday, one of our contractors cleared dozens of leaning, rotting and damaged cottonwood trees from alongside northbound I-5 near Kelso. He used a feller buncher to do the job, and if you’ve ever seen the History Channel show “AxMen,” you may have seen one of these beasts in action. Feller bunchers are great big, gnarly pieces of equipment that look like backhoes with pincers instead of a bucket. A massive rotary saw lurks beneath the pincers. The equipment operator uses the pincers to grab the tree, then cuts it with the saw and moves and stacks the log, all in one fell swoop. In six hours last Friday, the contractor cleared an area that would have taken up to two weeks if done manually. That freed up our crews to tackle other needs, such as pothole patching, slide cleanup and collision response. 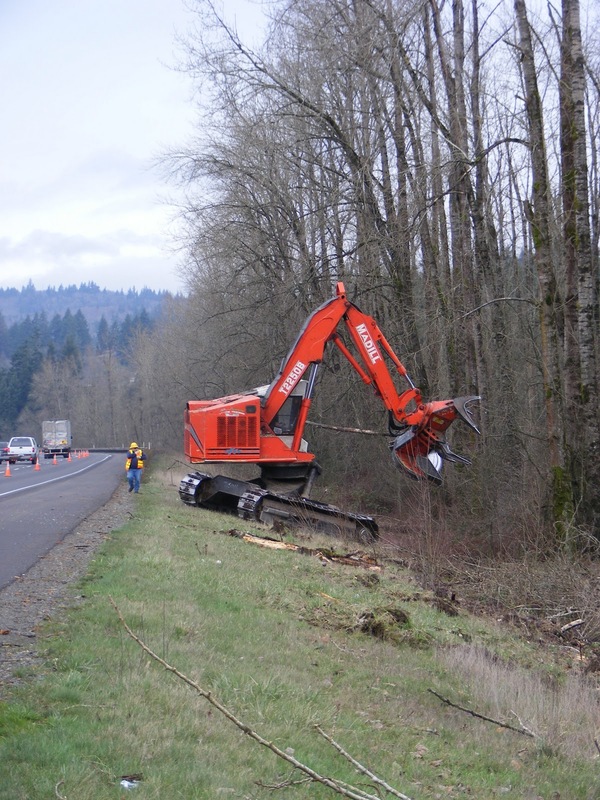 The swiftness and efficiency of the feller buncher not only saves time and money, it’s a safer way to log along a busy stretch of I-5. Things are much more controlled; rather than falling when cut, logs are held in place throughout the operation. 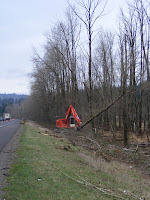 The operator is protected from falling branches by the feller buncher’s enclosed cab. 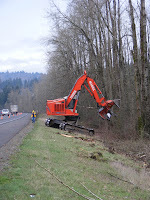 Like the hard-working loggers of “AxMen,” we’re grateful for technology that makes our jobs safer and helps us keep the everyday work of maintaining state highways from disrupting your travels.